It is almost June 1st.and the weather just keeps on being beautiful, its hot today, and i have to water my tree and other greens twice a day. 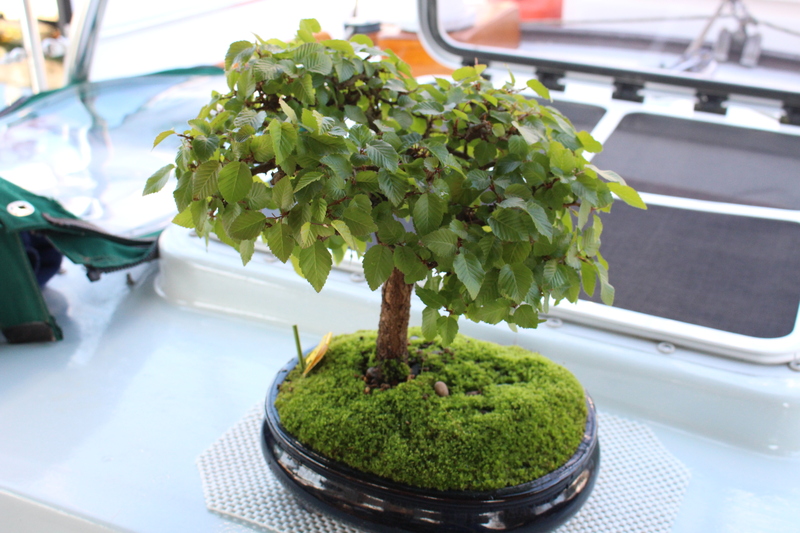 My little bonsai tree is thriving, it is so beautiful, full of little perfect green leaves, it is a Japanese Hornbeam, 68 years old and has lived on the boat for 13 years. It has moss growing on its soil, and usually i keep it in the cockpit, out of the sun, and away from wind. Every year i grow little violets too, in honor of my mom, who loved these little flowers, she always said that they had little faces, looking right at you!! Then i again this year ,grow my micro veggies, mainly lettuce, spinach and peas, we snip them off once they are 4 inches tall, the peas keep right on growing again, for a second crop. A friend of mine gave me some beans too, i think they are heirloom, all six of them are poking their heads out of the soil now, but….they grow very tall she says, so i am not too sure, she suggested to let them grow right up the mast but i think Bert will think differently about that…… We have been cleaning, scrubbing, right now Bert is waxing the hull, i scrubbed the cockpit and the wheel, which is cotton wrapped ,with fancy knots but does get very dirty, i cleaned it as best as i could, cannot put it to soak in a bucket…….. Bert ran the water maker yesterday , checked the batteries, and lowered the dinghy into the water. So, we are slowly getting ready, ready for some cruising.